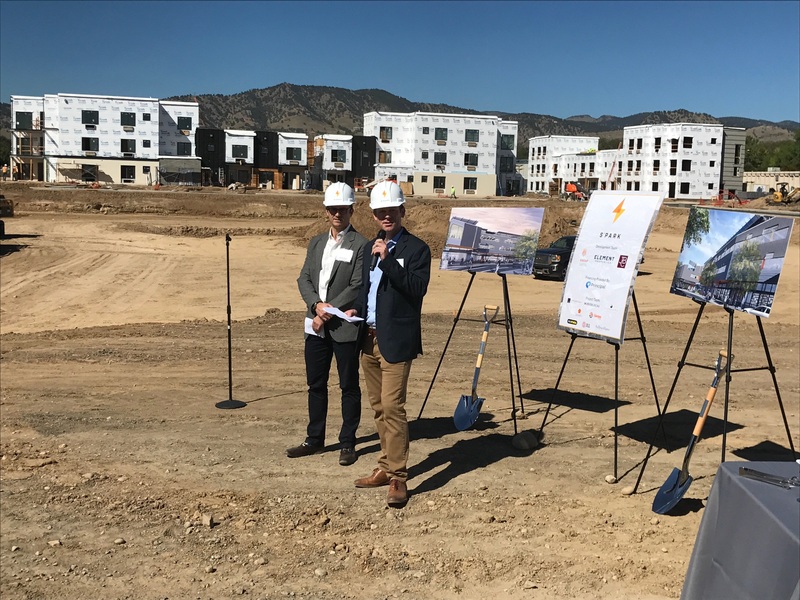 Scott Holton of Element Properties, right, and Justin Parr of The John Buck Co., address the crowd at a ground-breaking ceremony Thursday for two major elements of S’PARK, a mixed-use neighborhood development in Boulder. In the background are 45 townhomes already under construction called S’PARK West. BizWest/Doug Storum. 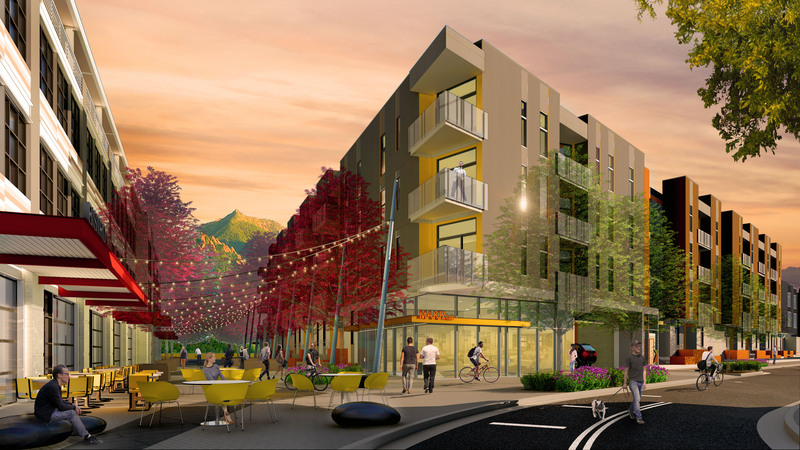 BOULDER — The developers of S’PARK, a project in Boulder that features housing, office and retail space, on Thursday marked the start of construction of two of the project’s premier parcels — Timber and Market — with a ground-breaking ceremony. Timber will offer 150 apartments at market rate, including studio-, one-, two- and three-bedroom apartments, with a below-grade parking structure and ground-floor retail. Courtesy Element Properties. Boulder-based Element Properties, and Chicago-based real estate firms The John Buck Co. and Kinship Capital are developing S’PARK, a 10.3-acre site at 3400 Bluff St., east of 30th Street bordered by Valmont Road to the north. It is at the site of the former Sutherland’s lumberyard. 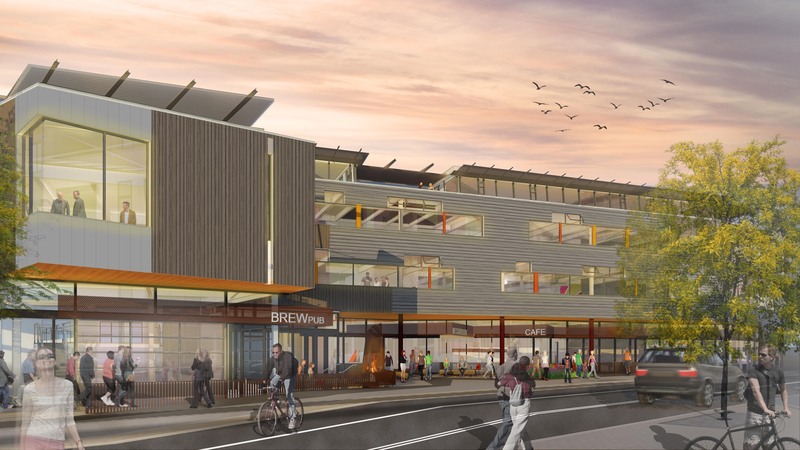 Scott Holton, a principal of Element Properties, thanked the city of Boulder and its planning department, development partners, and architects and builders on the project on behalf of his company partners, Chris Jacobs and Kevin Knapp. “S’PARK will help build our community, just as Sutherland’s did years ago,” Holton told a group of about 50 people attending the ceremony. The S’PARK project has been under construction for the last year with an initial phase of 45 affordable townhome units called S’PARK West, said Justin Parr, vice president at The John Buck Co., a private-equity real estate investment and development firm. He said the townhomes are expected to be completed during the first quarter of next year. Market will be a four-story, 50,000-square-foot mixed-use office building with ground floor retail along Valmont Road. Courtesy Element Properties. Market will be a four-story, 50,000-square-foot mixed-use office building with ground-floor retail facing Valmont Road. Boulder-based craft brewer Upslope Brewing Co. has claimed 8,500 square feet for a brewpub. Anticipated completion is August 2018. Timber will offer 150 apartments at market rate, including studio-, one-, two- and three-bedroom apartments, with a below-grade parking structure and ground-floor retail. Anticipated completion is May 2019. Parr said an additional 50,000-square-foot office-retail building and more apartments are included in the overall plan. Parr said when S’PARK is completed it will have 272 multifamily units, 100,000 square feet of office space, 40,000 square feet of retail and a 2-acre park. Developers will propose S’PARK as a LEED for Neighborhood Development Platinum project, a rating that requires green infrastructure, walkability, proximity to jobs and retail, among many other requirements. Project architecture was completed by Boulder-based Sopher Sparn Architects LLC and Phoenix-based Worksbureau Architects.